The purpose of a buyer persona is to help you identify the customer’s needs and wants so you can delight them with your products, services, and content, and earn their return business. This will also help you to determine where your customers spend time on the web and in the world, giving you insight into how to communicate with them, how to reach new customers, where and how to promote your business, and what types of content to produce. Another benefit is, you will gain an understanding of how your customers make purchasing decisions, so you can better target your marketing and move them through the sales funnel. From this point, you will be able to provide your company with valuable information on developing new or improved products and services based on the needs and wants of your current customers, allowing your relationship with them to strengthen and evolve. The first step to creating a buyer persona is to look through your list of clients and find the patterns. You may provide services to a general group of small businesses, or maybe you only service a niche of the consumer market. Figure out which groups you’re already successfully selling too. Create a list of good and bad clients that fall into the groups you defined. Ask if they would be willing to provide their opinions about your business. Most will be flattered and more than happy to help. To encourage people to agree to interviews, consider offering a small incentive such as a free meal or a gift card. Also, make sure it is clear this is not a sales call. You’re not trying to sell them anything, you want to learn from them about their lives, goals, and challenges. Once you have your interviewees, it’s time for the interview! For the first part of the interview, create an interview script with questions on their demographics, role, challenges, how they imagine success, and the reasons they chose you. Consider these questions from HubSpot to get you started, but also, adjust the questions so they are relatable to the specifics of your business or industry to make this persona useful for your company. What causes certain buyers to invest in solutions like yours, and what is different about buyers who are satisfied with the status quo? Do not confuse Priority Initiatives with pain points that you simply reverse-engineer based on the capabilities of your solution. You want to understand the personal or organizational circumstances that cause your buyers to allocate their time, budget, or political capital to resolve the pain. For example, you could guess that the marketing executive buyer persona has pain in the area of marketing metrics and campaign automation. But an insightful buyer persona would tell you which marketing executives are most (and least) receptive to your marketing automation solution and why. What operational or personal results does your buyer persona expect to achieve by purchasing this solution? Success Factors resemble benefits, but this insight is far more specific and written from the buyer's perspective. For example, you might currently emphasize your solution's impact on cost reduction, but an insightful buyer persona would identify the category and degree of cost reduction that buyers anticipate. Examples of personal outcomes include impressing peers, widening the buyer's sphere of influence, or increasing their ability to control something about their environment. Expect to gain insights into product or company-specific barriers that are no longer (or never were) factually correct. These perceptions often result from negative experiences with similar solutions, online interactions, or direct feedback from peers. Other barriers relate to personal or business obstacles that prevent your buyer from investing in change. Examples include the need for business process change, gaining acceptance from end users, or other politically-charged issues. This insight reveals details about who and what impacts your buyer as they evaluate their options and select one. To help you prioritize your marketing investments, you need to know which resources the buyer trusts at each step of their evaluation for this decision. For example, a marketing executive would not rely on the same resources for decisions about web conferencing and off-site event planning. For persuasive messaging and content, the Buying Process insight specifies the Decision Criteria, Success Factor, and/or Perceived Barrier that has the most impact on the buyer's choice at each step. Which aspects of the competing products, services, solutions or company does your buyer perceive as most critical, and what are their expectations for each? You will know which of your capabilities has the most impact on your buyer's choice to do business with you. (Tip: this is unlikely to relate to what is newest or most unique). This insight informs messaging and content marketing decisions, clarifying both the buyer's questions and the answers they want to hear. For example, if the buyer wants a solution that is "easy-to-use", the Decision Criteria Insight specifies which aspects of the solution this persona expects to be "easy to use" and how they determine which solution is the easiest. Once you’ve gathered data from your customer research and your interviews, it’s time to knit this information into a cohesive buyer persona. Begin by recording the basic demographic information of your buyer persona. Also record their goals, challenges, motivations, where they look for information, and how they like to be communicated with on a day to day basis. 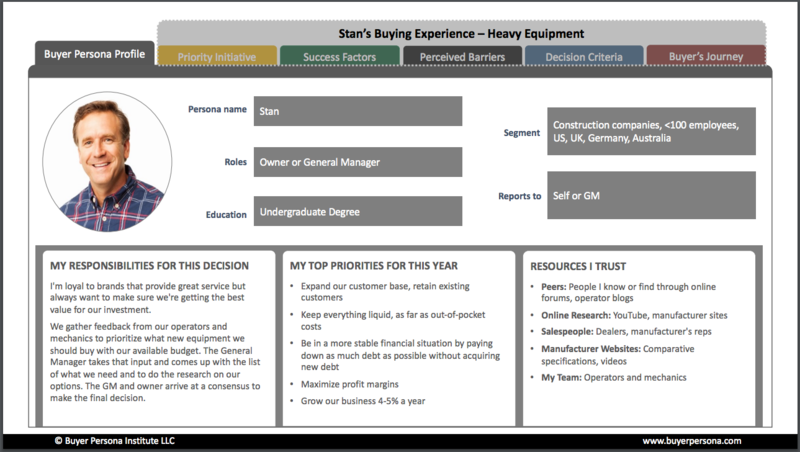 Distill all of your interview notes into 2-5 buyer personas. Using a persona worksheet like this one can help organize your thoughts and make sure you’ve covered all your bases. Use your buyer personas. Look at what they like about your company and do more of that. Also, find ways to stop doing what they don’t like. And, ensure your website messaging clearly shows that you understand their challenges and have a solution for them. From now on, everything you do should be with this persona in mind. You can create content that speaks to your persona’s challenges, write blog posts that answer their common questions and concerns, and create branded content that shows your company is in line with their goals and committed to solving their pain points. Post this content on the platforms your persona goes to when they’re looking for information, be that Facebook, YouTube, or e-newsletters. The persona’s usefulness doesn’t end with marketing. Your next task is to get everyone in the company on the same page about your marketing goals. The sales team, marketing department, human resources, C suite and other departments can all benefit from keeping your persona in mind. Your sales team can now have conversations with the leads that fit this persona in the way that they respond best to. Learning things like if your persona prefers to scroll social media or read a blog can mean a big difference in connecting with your audience. You can enroll leads that fit your persona into workflows that give them the information they want to know and personalize your style to suit the persona’s personality. Buyer personas result in better leads that are more sales-ready, because you’re reaching the right people by leveraging what they want, rather than by pushing what you want. They also provide a huge boost to your sales and brand and will help you provide better service to your existing client base. A well-researched buyer persona adds a human face to your marketing strategies and tactics and, with the proper consideration, can revolutionize the way you go about marketing. So, go forth! Begin your journey to more personal and effective marketing!